"The Queen Of Space". Sponsored by: Ralston Cereals (Space-O-Phone premium). Jelna Fenton is the owner of Trans-Orbit Lines, a freight line to the outer planets, with big plans. High adventure in the wild vast reaches of space, missions of daring in the name of interplanetary justice. 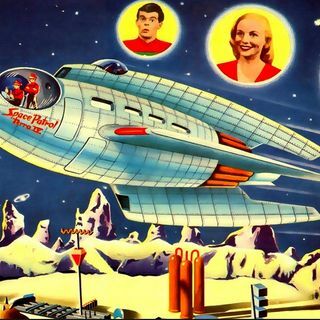 Travel in to the future with Buzz Corry commander in chief of the Space Patrol. In today’s transcribed adventure Buzz and Happy have just entered a spaceship in Neptune City’s spaceport in search of a ... See More traitor against the United Planets.